Utilising the power of email authentication, Email Fraud Defence protects your organisation from all phishing attacks that spoof trusted domains. Visibility of who is sending email across your email ecosystem allows you to authorise all legitimate senders and block fraudulent emails before they reach your employees, customers and business partners. Protect your email ecosystem from today’s advanced email threats including business email compromise (BEC) and consumer phishing. 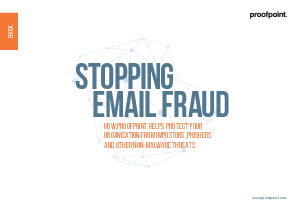 Proofpoint Email Fraud Defence gives you the visibility, toolset and services needed to authorise legitimate email senders and block fraudulent messages before they reach the inbox.